Tucson is hot, hot, hot both in terms of temperate and lifestyle. Mixed among the cowboys and old west roots, you will find plenty of modern eateries offering first class contemporary dishes all served with a side order of world famous Western charm. Serving beautiful food to hungry diners in Tucson, Prep & Pastry uses locally sourced ingredients to create gorgeous dishes. Modern canteen style surroundings make for a beautiful ambience with good food and great service. Diners can choose from buttermilk biscuits with duck and sausage gravy, Harissa shashouska, steak and egg, baked salmon and a decadent selection of French toast and toppings, as well as traditional bacon, eggs and English muffins. Great breakfasts come as standard at Prep & Pastry. Family fun aplenty at the laid back Baja Cafe. As a community eatery that supports local businesses and artists, you will find an eclectic selection of interior design and events all taking place here, as well as tasty Baja-style specialties that you can only find in Southeastern Arizona. With a large shaded patio outside, and plenty of seats inside, bring the family to enjoy unique local recipes made using nopalitos, hatch chilies and prickly pear. Customer favourites include Georgia Peach French toast, The Baja Breakfast or freshly made buttermilk pancakes. A smart urban kitchen in downtown Tucson, Nook is fast becoming a local hotspot for great quality New American cuisine. The restaurant also serves as a creative space for the local community and regularly showcases work by local artists. Diners are in from treat whether they are looking for something light and healthy, or for the full big breakfast experience. Choose from Nickel and Lox plates, power parfait granola and folded eggs, or fill your boots with breakfast tamale pie or steak and eggs. Serving innovative, made-from-scratch American cuisine, 5 Points Market & Restaurant creates tasty breakfasts using fresh, locally sourced ingredients. With juices made fresh to order and organic produce used wherever possible, fresh is best at 5 Points. A globally inspired menu offers healthy light breakfasts as well as sweet treats and freshly brewed coffee. Choose from Huevos Rancheros, smoked salmon Benedict or frittata’s made with Dirty Girl Farmette kale, or build your own breakfast from a massive selection of sides and staples including chipotle sausages, pinto beans and homemade sauerkraut. A traditional, no frills eatery offering great food and friendly service. Bobo’s opens early to feed hungry workers and offers filling plates of well cooked food all from breakfast, bunch and lunchtime diners. Menus are simple but well executed and include corned beef hash, polish sausages, buttermilk pancake stacks, chicken livers, omelettes and homemade sauerkraut, as well as traditional breakfast plates with crips maple bacon and organic eggs. Hearty breakfast dishes served up in fuss free surroundings in downtown Tucson. This charming, tropical themed cafe is a hit with Tuscon locals and visitors alike. Sunny Daze Cafe offers over-the-top beach based decor that brings a smile to your face before you have even tasted the finely crafted breakfast menu, served up by smiling, friendly waiters. Food is fresh and tasty and has a distinctly Southern feel to it. Chose from Cajun sausage &eggs, Mexican Huevos Ranchero, SD Biscuits & Gravy Combo or California steel omelettes, or go for Marks Big Daddy bBreakfast complete with hot cakes and filled hash browns for a real gut buster. Bisbee Breakfast Club on Broadway is the fifth official outpost of the BBC in southern Arizona, proving just how popular their breakfast and brunches really are. 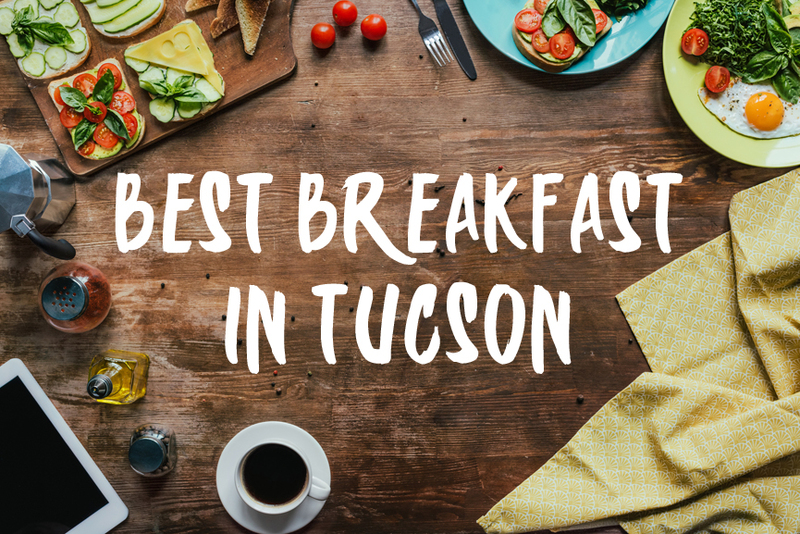 With a full espresso bar for steaming hot coffee made from fresh, locally roasted beans and a varied menu to choose from Bisbee’s is one the best places to go for a true Tucson breakfast experience. Visitor favourites include seasoned steak and eggs, Huevos Rancheros and D’s Potato Cakes with Applesauce & Sour Cream. Café Marcel is a Creperie &espresso bar that serves up delicious and innovative crepes with an authentic European flavour. They already extensive menu provides a wealth of options for lovers of both sweet and savoury crepes, and Michelle and the team are more than happy to mix and match whatever flavours take your fancy when you visit. Customer favourites include pear, apple, brie &honey or Nutella and banana, or savoury favourites include fresh spinach, tomatoes, feta, &pesto. Teaspoon is a sleek modern eatery that offers globally inspired cuisine designed to please the tastebuds of Tucson diners. Owned by two sisters, Teresa and Mary, Teaspoon is real family business that offers some of the best breakfast dishes in town, including Hong Kong street waffles, Challah vanilla bean French toast and Chilaquiles with chicken. Diners can even try the unusual but rather scrumptious breakfast pizza loaded with Iberia chorizo sausage, eggs and tied greens. 4 Seasons offers an inspirational menu, combining the flavours of Thailand & China with classic American dishes. Delivering high quality food at affordable prices, diners can relax on the patio or snuggle up in a booth inside. Customers favourite breakfast dishes include banana, apple and walnut pancakes, Hillbilly fried rice and homemade dumplings and rice. A little bit of what you fancy goes a long way at the 4 seasons.